The EDL's official Facebook image for the protest on Aug 1. Our sisters only event is an event restricted to female gender only and boys up to the age of 4 years old. All rides and attractions are open as normal. Clothing during this event must be both culturally and islamically appropriate for the event. There is a designated prayer area located in the reception area. All windows are blacked out with only female staff/lifeguards on duty throughout the night, Female staff will guard the front entrance to make sure that no males enter the facility. Nor is the event strictly a ‘day’ as it takes place between 7 and 9pm. This simply reflects a wider strategy to target various demographics including ‘male-only’ and events exclusively for nudists. There is no ‘Muslim-only’ event. 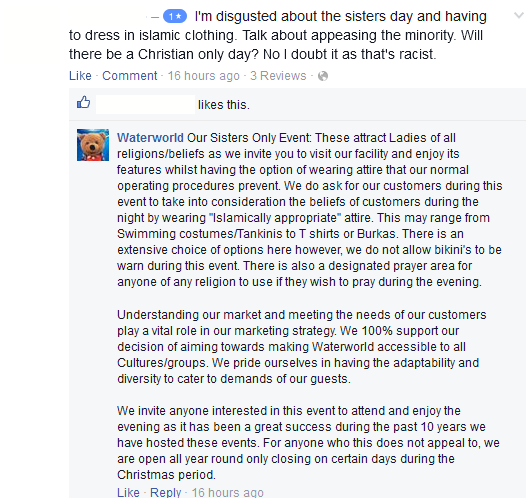 Following a litany of complaints on Facebook, staff at Waterworld attempted to respond to accusations of discrimination by stating the special event was also open to non-Muslim women. It remains understandable that some will not attend given the “Islamically appropriate” theme. A screenshot from Waterworld’s Facebook page discussing the event. Nor are these events a rarity at Waterworld. A blog from 2011 discussed the upcoming ‘Sisters only’ event at the venue. Others used Facebook to label the company ‘racist’ and insisted on a boycott. The charity Interpal hosted two events at Waterworld earlier this year. Interpal has for years, faced accusations of funding Hamas (the armed wing of the party is a proscribed terrorist organisation). Three separate Charity Commission investigations looked into the alleged links that date back to 1996. In 2009, it ruled that a Panorama investigation ‘lacked‘ the necessary evidence to prove a terrorism link. But Interpal had “not adequately managed” its relationship with the Union for Good and its “continued membership of the Union for Good was not appropriate”. In 2012, a follow-up enquiry noted that Interpal had implemented its 2009 recommendations, including severing links with Union for Good. Another chairty, dogged with allegations of similar links, organised an event at Waterworld in May. The story is reminisicent of how the far-right exploited stories concerning Legoland and Vue Cinema that made similar allegations (and unfounded) allegations of non-Muslim discrimination.